With Ver. A.00.185, and Garmin's MapSource program, Ver. 6.5.0, which introduced the ability to read/write .gdb files (Ver. 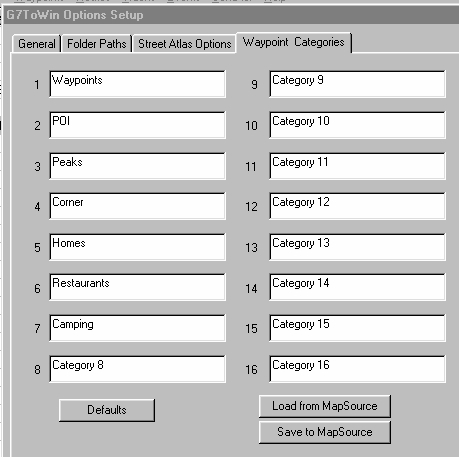 2 only), G7ToWin will send files to an executing MapSource using the same method used to send data to an executing Street Atlas Version 3-9. (See examples below). Now with Ver. A.00.200f, the program (with Windows XP) will support most Garmin USB data transfers. Also the program now supports Garmin lower-case letters, control the waypoint name length, support of 'transparent' tracks, and increases the number of routes supported. Added is a Category edit for Garmin Waypoint Category values. Added 64 Custom waypoint symbols to MapSource symbol set and changed Ozi .wpt, .plt, and .rte routines. G7ToWin will export all Ozi file types. While G7ToWin has always supported Garmin receivers, it will also support up/downloading waypoints, routes and tracks of the Magellan M-315/320, Map 330, Tracker, ColorTrak, Map 410, SporTrak (Pro and Color), and Meridian series receivers. These are the only Magellan receivers verified to work with the program to date. The same version also supports a number of Lowrance and Eagle receivers. Note that the file format (*.g7t) has been created. When you have saved data in this format, and have registered it to g7towin.exe to be the target of *.g7t files in the "Open With, Other, Programs" dialog box, a double-click on the file launches G7ToWin and displays the data. The program now also reads and writes the new .gpx format (which supports waypoints, tracks, and routes) and uncompressed .loc files. Garmin: Under GPS, Commands is: Get Voltage, Get Time, Get Position, Get Supported Protocol, GPS Power Off. Also under GPS is: Get GPS ID (GPS name, Software version, Coded model number, Base map Info, and some installed map Info). Get and Show Display Bitmap (Ctrl-D) downloads a screen shot. NOTE: This feature works for most Garmin units except the latest models. To download screen shots from them, use Garmin's xImage from (THIS) source. Magellan: Under GPS, Commands is: Delete All Magellan: Waypoints, Tracks, Routes, Fix, and Data. G7ToWin and G7ToCE (a version of G7ToWin for use on Windows CE devices) will copy the position returned by the 'Get Position' command to the Windows clipboard in the current datum and display format. The fields are separated by the TAB character and may be pasted directly into other applications. This list is one of four dropdown lists on the main page, Waypoints, Routes, Tracks, and Events. The lists are very useful in editing and researching the waypoints, routes and tracks. A feature of this list is that any of the waypoints can be selected as the "Reference". In the above example, 'GUADALUPE' has been selected, and then the Reference Distance column has been sorted. The distances to all the other waypoints are then displayed. NOTE: You cannot change the position of the Reference Waypoint while it's the Reference. In fact, each column of the waypoint list can be sorted. Sort by Lat. to arrange in a N/S order, sort by Long. to arrange in an E/W direction, and sort the Comments alphabetically. NOTE: Individual or a selected group of waypoints can be uploaded to the GPS unit. If any waypoints are selected before the column is clicked to start the sort, the same waypoints will be selected after the column sort and the list will be scrolled to ensure that the first selected waypoint in the list is visible. This aids in analyzing the waypoint list. Select GPS: If the Com port, USB box is NOT selected, then in the Select GPS box, you have access to Magellan* and Lowrance receivers. Otherwise, only Garmin units may be accessed. *For Magellan receivers, Select GPS (Magellan), then select the COM Port, and Speed (We get the best results at 9600). Set the unit's baud to 9600 and NMEA to OFF. For Garmin receivers, just Select GPS (Garmin or Garmin_USB), and the Speed is selected automatically. Set the non-USB GPS unit's protocol to the Garmin mode. NOTE: G7ToWin Help has the unique ability after displaying the Configuration menu to press F1 (or the Help button) to get instructions on how to use boxes in any of the tabs in the Configuration menu (below). Click on any yellow box or button to get information and instructions on how to use the box. Categories are extra "identifiers" you can assign to a waypoint in addition to the name. Then the waypoints can be sorted by name or category. Both Garmin's MapSource and G7ToWin support 16 waypoint categories with up to 16 characters and spaces per category. (However, the two programs handle categories differently.) Categories become useful when you want to work with only one category at a time (or several, if using G7ToWin.) The 'Category' of a waypoint, however, can't be uploaded to a GPS unit. NOTE: Category names are stored in the MapSource registry. All that's added to a *.gdb waypoint is a bit representing 1 thru 16. However, in .gpx files, the actual category name is stored. If a .gpx file is read and a waypoint in that file contains a category that does not exist in the set of categories currently defined in the program, the category is considered unknown and is ignored. This action is taken by both G7ToWin and by MapSource. The nüvi line of Garmin car units do not use the Garmin data transfer protocol used in their hand-held units. The car units use .gpx files which can contain waypoints, tracks, and routes. G7ToWin can read the two .gpx files found in X:\Garmin\GPX where X: is the drive created by a USB connection to a PC. The files are Temp.gpx and Current.gpx. The nüvi's current Waypoints, Tracks, and Routes are written out to the Current.gpx file when connected to a PC. Upon disconnecting, the unit will read the Temp.gpx file (if newer). Thus after arranging your data in G7ToWin, save it as Temp.gpx in the nuvi GPX folder. and they will ADDED to the unit. However, the nüvi will not automatically read the routes from the Temp.GPX file. You must go into the MyData menu on the GPS and tell it to read the routes from the file. You also have to do this when MapSource writes routes to the unit. You can now edit waypoints for use as Garmin POIs and have the addres/phone info edited. G7ToWin will now write .gpx files and .csv files with full support for the format used by the Garmin POI loader. Writing a .gpx file will just contain the data while you have to select the .csv POI file format to write a .csv file that the Garmin POI loader can read. In G7ToWin they are accessed from: File, Configuration, Waypoint Categories (below). From here you can edit the name of each category. Then from the waypoint (LIST), you can assign waypoints a category from the Edit Waypoint feature. From the List of waypoints, right-click on ANY waypoint. This brings up an option to Select by Category. Now you can select as many categories as you want to be highlighted in the List. Right-click on a highlighted waypoint and you have the option to: Send Selected Waypoints to a file, MapSource, a GPS unit, or StreetAtlas. Here Categories are accessed from: Edit, Preferences, Waypoint Categories. From this page all the categories can be renamed. (Or you can send the categories in G7ToWin to MapSource if you don't want to type them in again.) 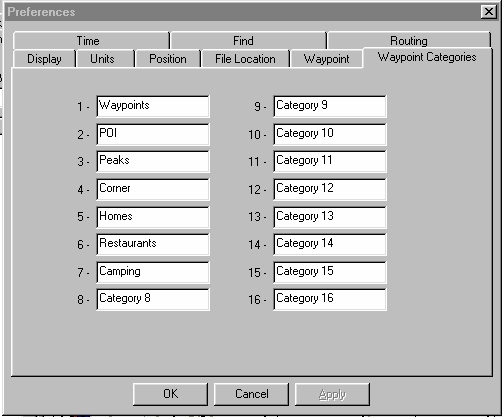 You select a category for a waypoint by editing the waypoint and checking the box bedside the desired category. In the Waypoints tab is a drop-down menu, Show Waypoints in Category. Here you can select ONE category. Then only waypoints of this category will be displayed. Right-clicking on these waypoints, you have the option to Select Maps Around Waypoints, Show Selected Waypoints on Map, or delete the waypoints. If one executes a 2nd instance of MapSource, it is possible to cut or copy the waypoints in the selected category and past them into the 2nd instance, where they may be processed as a group and saved to a file. Thus, G7ToWin allows you to "have the best of both worlds" when working with categories. NOTE: All of the data downloaded into G7ToWin except Magellan POIs (see Magellan POIs in the G7ToWin help file) can be displayed on any version of Street Atlas 3 thru 9 and be configured to one's liking. Above are some suggested settings to control how the data is displayed on Street Atlas.